At one time in my life, there was not a bigger Dallas Cowboy fan alive. That intensity of my fanaticism has changed with the owner from Arkansas, the move to Arlington, the creation of the Tennessee Titans and some maturing.. Still, I can’t stop rooting for the team in the familiar uniforms. Still, something has always bothered me about the iconic Dallas Cowboys uniforms. They don’t match! I finally confirmed this officially with an ESPN blog I found by journalist Paul Lukas. The team actually has two different sets of silver pants in its wardrobe: one with a greenish-blue tone and royal blue piping, which is worn with the white jerseys, and a more conventional silver version with navy piping, which is worn with the club’s seldom-seen blue jerseys. 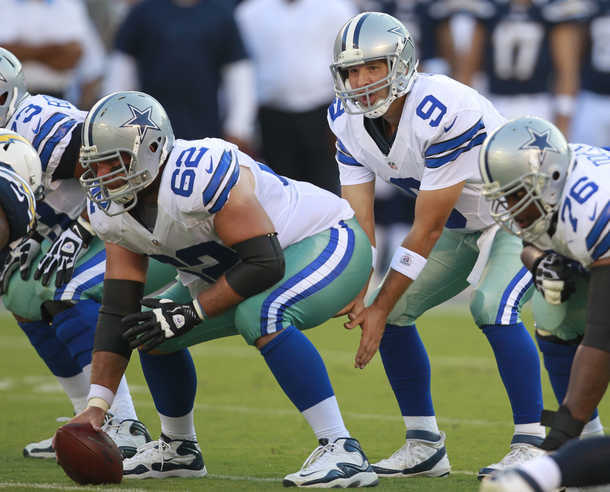 Not only that, the Dallas helmet doesn’t match either of the pants’ hues, meaning the Cowboys actually use three shades of silver. The Cowboys’ chromatic inconsistencies go beyond silver. When they wear their white jerseys (i.e., about 90 percent of the time), their socks, pants striping and uni numbers are royal, but the blue on their helmets is navy, so the two blues clash. This Wednesday Night – Let’s Move Forward! Here I thought it was just me! Plus I’ve got into debates with ppl claiming they don’t even see the blue-green tint to the shiny silver pants…even to the point of stating its just a shiny gray!